The Victorian Railways used a variety of both 4 wheel and bogie open wagons for the transport of a wide range of loads. The first open wagons were 4 wheel wagons of all wooden construction, had no brakes and could carry up to 8 long tons (8.1 t; 9.0 short tons). Westinghouse brakes were added from 1891 with most vehicles modified by 1905. The addition of brakes and the use of steel frames meant that loads by 1928 vehicles with 27-long-ton (27.4 t; 30.2-short-ton) capacity had been developed. The first bogie open wagons were built in 1880 and had a capacity of 20 long tons (20.3 t; 22.4 short tons). Bogie vehicles stayed in the minority of vehicles up until their widespread introduction in the mid-1950s with the construction associated with Operation Phoenix. The first I wagon was built in 1859 of all wooden construction and could carry a load of 8 tons. In 1902 the first 15-long-ton (15.2 t; 16.8-short-ton) I wagons were built and got the nickname 'Tommy Bent' Wagon. From 1907 to 1926 the 'standard I wagon was built which could also carry 15 tons. These wagons had a longer wheelbase than the earlier 15 ton wagons. IA wagons are identical to the steel 15-long-ton (15.2 t; 16.8-short-ton) I wagons. The only difference is they were recoded to allow for dual rating of 11 and 15 tons. this allowed loads of up to 11 long tons (11.2 t; 12.3 short tons) being charges at the 11 ton rate and loads 11 to 15 ton at the 15 ton rate. This recoding started in the early 1929 and continued while IB wagons were being scrapped. In 1929 all I's with a load of less than 15 long tons (15.2 t; 16.8 short tons) were coded to IB to separate the lower capacity wagons from the newer higher capacity wagons. Approximately 350 I/IA wagons were converted for tippler traffic from 1954 to carry coal between Yallourn and Newport Power Station. Later traffic and then the only tippler traffic was between Bacchus Marsh and Fairfield. These wagons were modified by removal of the doors and replacing with a steel plate welded in place. These wagons were converted from other classes for timber traffic. These wagons the same as the standard I wagon with a stronger underframe making them strong enough to carry a load of up to 22 long tons (22.4 t; 24.6 short tons). 350 of these wagons were made between 1926 and 1927. In 1929 the first 27-long-ton (27.4 t; 30.2-short-ton) wagon was produced. 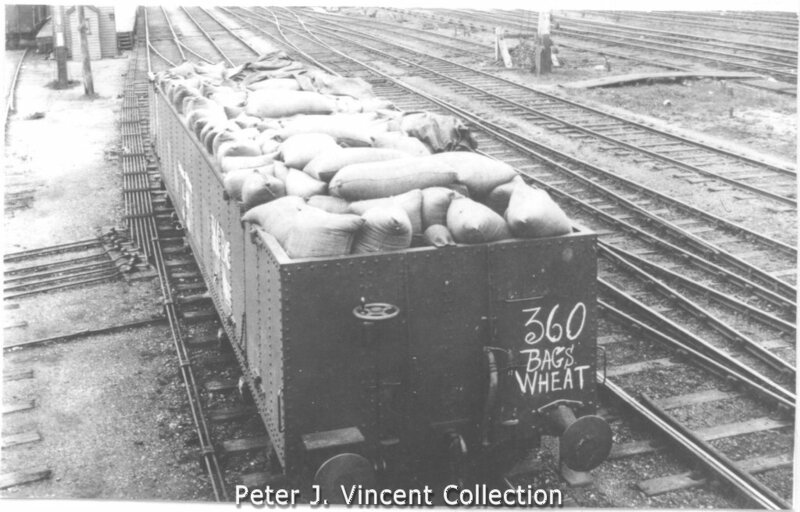 In 1935 the VR first started transporting bulk grain. To cater for this traffic 200 of the standard I wagon were modified with grain proof seals and coded G.
In about 1956 due to the number of GY wagons these wagons were no longer required for bulk grain and were reclassified to I or IA. 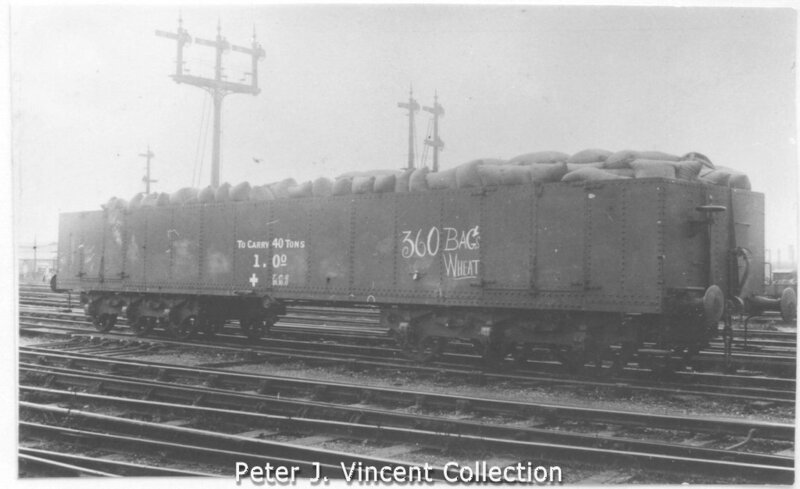 In 1939 the VR produced the first of about 5000 wagons for carting bulk grain. Construction was carried out regularly from 1939 to 1958 with the majority being built in the late 40's and early 1950s. These wagons could be seen in long rakes of up to 73 wagons hauling the grain harvest. When not required for grain transport the GY could be used for general goods service. These wagons were a grain proofed version of the IZ wagon. This wagons were a general goods version of the GY wagon. As they were not designed for bulk grain so did not have the grain proof seals around the doors. Over time, four-wheeled wagons became obsolete as a design. Bogie vehicles could run at higher speeds and with more wheels they had a better axle-loading, meaning that they could carry a larger load. To this end, a number of classes of bogie vehicles were constructed. In 1925 the South Australian Railways placed a large order for rolling stock with the American Car & Foundry, USA. The Victorian Railways elected to tack on to that order two louvre vans, two flat cars and two open wagons, becoming 1 and 2 V, S and E respectively; the equivalents of the South Australian Railways M, Fb and O types, along with a class of 12 J-type hopper wagons. The vehicles were assembled at Newport Workshops with supplied components including pressed steel ends, sides and doors, for a capacity of 44 tons. As the tests in both states proved successful, the Victorian Railways constructed a further 200 E type open wagons between 1927 and 1928. From 1941, 100 randomly selected E type wagons had their sides, doors and ends removed for conversion to S type flat wagons. The vehicles retained their numbers except wagon E1, which became S203 because the original S1 was still in service. Of those converted, following World War II 20 wagons were further converted to tank wagons. Another 14 were restored to open wagon format before later being converted to tank wagons, while 38 were converted directly from open to tank with no intermediate flat wagon stage. In the late 1950's the riveted bodies of the E wagons were wearing out, so welded components similar to those used in the ELX program were used as required. Some wagons were specifically allocated to State Electricity Commission traffic, running wooden power poles from the Brooklyn depot to various country depots as required. These units had their doors removed and bolsters fitted to the floors to make removal of the poles easier. 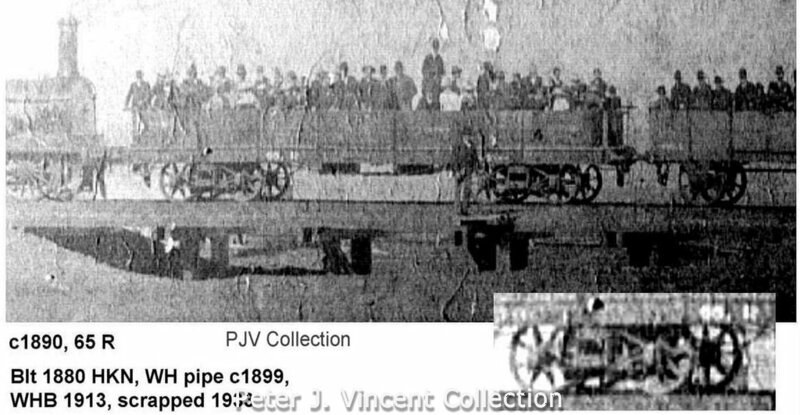 13 wagons were reclassed EF and fitted with roller bearing bogies and grade control equipment for use on the standard gauge line. These vehicles retained their E wagon numbers, but when made bogie-exchangeable they were recoded to EX and renumbered in the new series 1-13. 15 wagons made it to the 1979 recoding, becoming VOAA or VOAF depending on the bogies fitted. In photographs, the ELX is most easily distinguished from the similar E wagon by the fact that the ELX has four panels between its side doors, while the E wagon only has two. Twenty six of these wagons were built between 1964 and 1965, they were numbered 1 to 26. Primarily designed for transporting sheet steel, they also saw use as general wagons due to the design being very similar to the ELX Wagon. In the late 1960s they were used for transporting pipes for pipeline projects in Victoria. The Railways' second foray into proper bogie open wagons, these six vehicles were very different from their R type predecessors. The new wagons were massive, being billed as "the largest bogie vehicle '..in the British Empire..'." The first unit entered service in 1899 as a trial of the new design, featuring plate frame sides and ends, two sets of double-doors per side, trap doors in the undercarriage and a 45-ton loading capacity - nearly twice the nearest competitor. Six-wheel plateframe bogies were fitted. The wagon was supposed to be used on locomotive coal traffic from Wonthaggi to Melbourne, but in practice the wagons could not be easily unloaded on arrival. Despite this, a further five units - OO2 through OO6 - entered service in 1902. Peter Vincent believes that all six had been built as a batch, but after the failure of the first vehicle the remainder were kept in storage until they could be made useful. A pair of photographs show OO1 downrated to 40 tons and carrying 360 bags of wheat, though this was most likely a trial rather than a proper allocation.12. In 1912 the vehicles found a new purpose, being fitted with extended sides and a new corrugated roof. They were then allocated to breakdown trains around the state, as mobile tool kits to store much of the necessary equipment for rerailing of locomotives and other wagons. 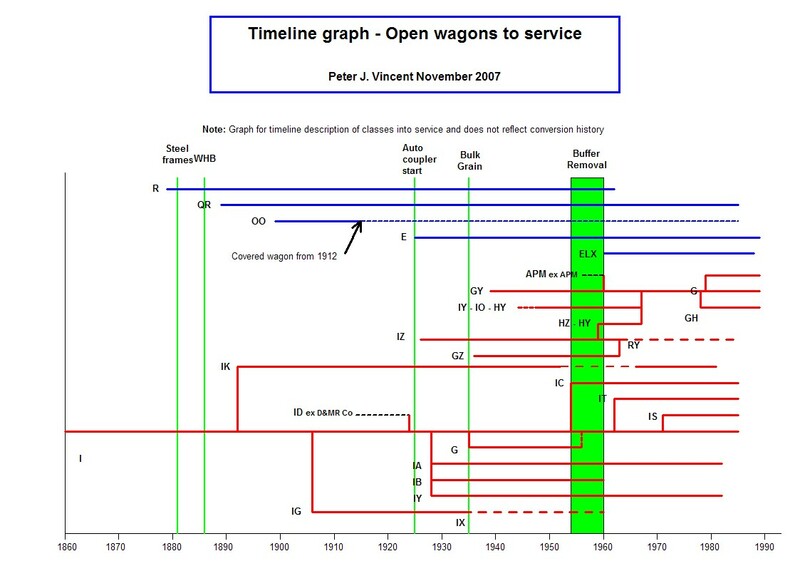 In this service the wagons, now "vans", replaced older S type breakdown vans which had initially entered service as boxcars in 1880. They kept their OO codes until 1956, when they were reclassed HH. The design of the QR was effectively a compromise between the existing designs for medium-size flat wagons (Q) and medium-size open wagons (R). The ends were fixed, but the three drop doors on each side could be removed if required. The first vehicle entered service in March 1889, and was deemed successful. From July 1890 through May 1892, 150 wagons were constructed by Wright & Edwards at their Braybrook workshops on behalf of the Victorian Railways, followed by QR152-201 in 1892 constructed by the Railways, rather than being contracted out. These initial wagons were built with swing-motion, diamond-frame bogies; the underframe used both steel and wooden components, and was reinforced with truss rods. The final result provided a wagon with capacity of 26 LT 0 cwt 0 qtr (26.42 t). The design was slightly altered in 1912 and 175 wagons entered service in five batches up to February 1924, when QR376 entered service. These vehicles were initially distinctive in their use of plate-frame bogies (otherwise used on heavier flat wagons, like the QB series), and were rated at 30 LT 0 cwt 0 qtr (30.48 t) load. The 1919 General Appendix indicates that only QR trucks with strengthened draw gear (no's 202-351) were permitted on Express trains, and even then that they must be attached immediately behind the engine. Their use on any type of passenger trains required the explicit permission of the General Superintendent, and the Train Examiner was required to check the vehicle before its inclusion in such consist. A further 30 wagons, QR 377 to 406, were built in 1927 to an extended design with four doors per side in lieu of three. The final member, QR407, was constructed in 1930 using leftover parts and matching the Type 2 design. In the 1930s the automatic coupler project saw the underframes replaced. The new design was all-steel, reinforced with centre sills in lieu of the truss rods and heavier bracing on the ends, and the brake equipment on the first 201 wagons was upgraded from the previous combined brake cylinder and auxiliary reservoir to a larger brake cylinder and a separate auxiliary reservoir. When the buffers and truss rods were removed in the 1950s, the wagon capacity was boosted a further ton. The 1936 General Appendix specifies that QR wagons 394 and 396 "have been specially prepared for the conveyance of theatrical scenery, &c., by Passenger trains. When no so utilised they are to be located at Port Melbourne for terminal traffic. A circular will be issues on each occasion that these trucks are used for the conveyance of special traffic." In 1979 the class was recoded from QR to VOWA, translating to Victorian Open, Wood and Low Speed respectively. Some wagons were allocated to metropolitan-area work from 1983, and these had 2000 added to their identities, i.e. VOWA356 became VOWA2356. The wagons were generally removed from mainline service and transferred across to maintenance trains in the mid 1980s, and recoded to VZWA with the "Z" indicating that change, and vehicles previously renumbered retained that change. Works wagons were also generally had a 30 cm-wide vertical green stripe applied to the right-most door, to help yard workers identify them. These were the first type of bogie open wagon used by the Victorian Railways, with 70 units constructed in 1880 by Harkness & Co., of Sandhurst as part of a batch, which also included 20 bogie boxvans of the S type. Both types of wagons featured a distinctive timber underframe design that was longer than the body, and were fitted with plate-frame bogies although some later received bar-frame bogies. They were rated to carry 25 tons. The vehicles had a very short working life, with many scrapped by 1899 and the remainder used in departmental traffic. R46 simply vanished in 1886, and R64 had its sides removed around the same time. The last years in traffic saw the wagons modified and used as mobile coal stages for refuelling of steam locomotives. Some, such as R6, were erroneously recorded as scrapped early, only to make reappearances decades later. Interestingly, for the most part the odd-numbered wagons were scrapped much earlier than the even-numbered wagons; of the 31 units scrapped in 1891, only nine were even-numbered. Many of the remaining wagons had coupler modifications applied around 1910. Some wagons were used in the Melbourne electrification program, including R4, R24, R47, R57 and R65, while others, such as R10, were utilised by the way and works department. In 1903 R22 was scrapped, leaving only 11 vehicles in service. These all lasted another few decades until being scrapped in the period 1931-1937, excepting R47 and R10 in 1944 and 1945 respectively. Also in 1944, iced wagon TT45 was cut down and reclassed as the second R11, until being scrapped in 1958. Just like the broad gauge railways, the 2 ft 6 in (762 mm) narrow gauge lines required open and flat wagons for general goods. Over two hundred were constructed between 1898 and 1914. In general, open wagons have been painted in Victorian Railways Wagon Red livery. The grain-proofed wagons had a diagonal yellow stripe in opposite corners to readily identify these vehicles from non grain proofed wagons, and from 1970 the GY wagons were painted Hansa-Yellow. Steam Era Models produce plastic kits of the GY wagon, Tommy Bent I wagon, the standard I/IA wagon and IY wagon, and a slightly more difficult kit of the E bogie wagon. The four-wheel wagons generally retail for up to A$20, while the E bogie wagon retails for around A$25. Precision Scale Models has previously produced a 5-pack of GY wagons in the VR Brown Livery with yellow stripe, including numbers 4380, 4897, 5236, 5633 and 6002 for A$1,500. Both Austrains and Powerline produce ready-to-run models of the ELX in various forms. Austrains has released 3-packs containing flat-sided ELX 5-27-44 or 11-47-65, strengthened ELX numbers 67-96-101 or 72-97-105 and ESX open-sided 3-10-24 or 7-13-20. All wagons are in VR Wagon Red livery. Each three-pack retails for around A$140. The company has also indicated that they will produce a ribbed-sided ELX as well as the South Australian Railways and Australian National variations, and they are looking into producing the V/Line and further livery options. Th wagons do not come with Kadee Couplers fitted, but they use a high quality metal coupler that looks similar to the Kadee 58/158 coupler. Powerline has chosen to produce only the ribbed-sided ELX wagons, and these retail for around A$30 with the plastic "PLM" couplers, or A$35 with real Kadee No.5 Couplers. The wagons feature proper metal wheels in their bogies. Variations include the AN-liveried AOBX 527 and 533, SAR ELX 502 and 504, V/Line Brown VOCX 294-D and 451-E, VR Brown ELX 110, 259 and 379 and VR Brown VOCX 157-Y, 246-E and 339-H. However, all wagons of the same version (i.e. both SAR 502 and 504) have the same catalogue number, so customers will need to be specific if ordering by phone or email. Wagons with a Kadee Coupler have the letter A after the catalogue number, i.e. PD604A. Railmotor Models has released a variety of polyurethane "loads" to fit inside the Powerline ELX wagon, including coal, ballast and sleeper loads in various colours.